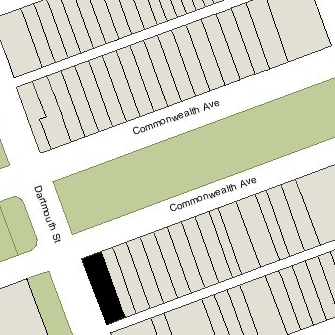 152 Commonwealth (287 Dartmouth) is located on the SE corner of Commonwealth and Dartmouth, with 150 Commonwealth to the east, 160 Commonwealth to the west, across Dartmouth, 303 Dartmouth to the north, across Commonwealth, and 283 Dartmouth to the south, across Alley 435. 152 Commonwealth was built ca. 1870 as the home of Jarvis Williams and his wife, Margaret Elizabeth Ann (Lunt) Williams. They previously had lived at the Tremont House hotel and also maintained a home in Cambridge. He was a banker, commission merchant, and treasurer and manager of the Hinkley & Williams Works (manufacturers of steam locomotives). 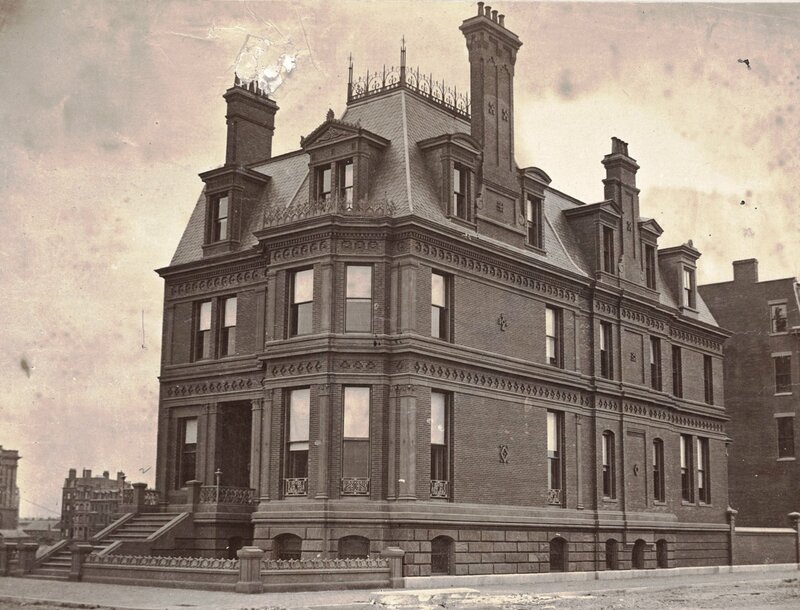 152 Commonwealth was built on a 38 foot wide lot which Jarvis William purchased from the Commonwealth of Massachusetts on August 30, 1870. That same month, he also purchased a 20 foot wide lot to the east, which he left vacant. Click here for an index to the deeds for 152 Commonwealth. Bainbridge Bunting’s Houses of Boston’s Back Bay does not attribute the house to a specific architect. 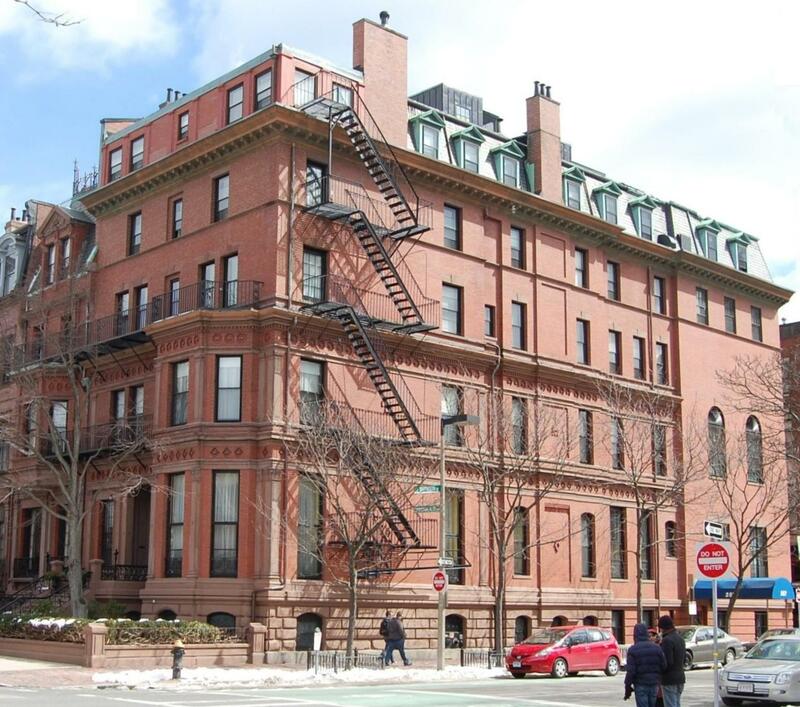 Susan and Michael Southworth’s AIA Guide to Boston (Second Edition) indicates that it was designed by Peabody and Stearns, probably because 150 Commonwealth — which was designed by Peabody and Stearns in 1880 — was annexed to 152 Commonwealth in 1926. However, The Chilton Club is in possession of original documentation which indicates that it was designed by Henry Richards of the firm of Ware and Van Brunt. Jarvis Williams died in November of 1870, soon after the house was completed (152 Commonwealth is shown as his address in the Boston Death Register). Margaret Williams lived at 152 Commonwealth with their sons — Charles Jarvis Williams and Reuel Williams — until mid-1871, but moved thereafter to a newly-built house at 297 Marlborough. On June 3, 1871, 152 Commonwealth and the vacant lot at 150 Commonwealth were acquired from Jarvis Williams’s estate by Richard Baker, Jr. He and his wife, Ellen M. (Whittemore) Baker, made it their home. They previously had lived at 47 Mount Vernon on Beacon Hill. They also maintained an estate, Westcliff, in Newport. Richard Baker, Jr., died in January of 1875, leaving 152 Commonwealth and the lot at 150 Commonwealth in trust for the benefit of his wife and their children. Ellen Baker continued to live at 152 Commonwealth and in Newport. In 1880, the Richard Baker estate had a new house constructed on the empty lot at 150 Commonwealth, which it leased to Dr. Orlando Witherspoon Doe, a physician. The Bakers’ four children lived with Ellen Baker at 152 Commonwealth and Newport: Mary Rich Baker, William W. Baker, Alice Starr Baker, and Richard Baker, III. Mary Baker married in June of 1885 to leather dealer Thomas Owen Richardson, and they moved to 131 Marlborough, Alice Baker died in August of 1880. William Baker died in April of 1882. And Richard Baker died in April of 1896. Ellen Baker died in September of 1896 in Newport. 152 Commonwealth was not listed in the 1897-1900 Blue Books. On May 7, 1900, 152 Commonwealth was purchased from the Baker estate by William Bowditch Rogers, a stockbroker. He and his wife, Augusta (Kellogg) Rogers, made it their home. They previously had lived at 151 Commonwealth. The Baker estate continued to own 150 Commonwealth. During the 1906-1907 winter season, the Rogerses were living elsewhere and 152 Commonwealth was the home of George Bridge Leighton and his wife, Charlotte (Kayser) Leighton. George Leighton was president of the Allegheny By-Products Coal Company, and previously had been president of the Los Angeles Terminal Railway and then of the Leighton & Howard Steel Company. By the 1907-1908 winter season, the Leightons had moved to 381 Commonwealth and the Rogerses were once again living at 152 Commonwealth. They continued to live there during the 1909-1910 season, but moved there after to Dedham. On April 29, 1910, 152 Commonwealth was purchased from William Rogers by the newly-formed Chilton Club. The Chilton Club was founded in 1910 as a women’s club, which it remained until 1988, when it began admitting male members. 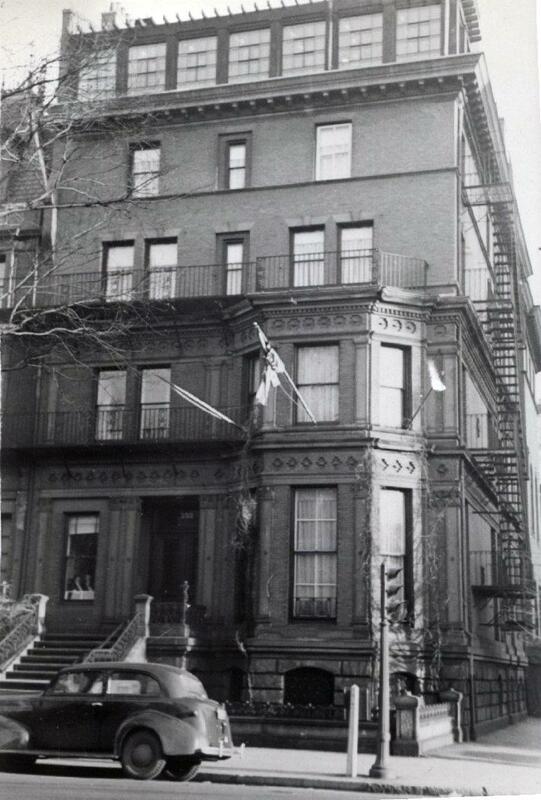 Having acquired 152 Commonwealth, in May of 1910, the Chilton Club applied for (and subsequently received) permission to significantly remodel and expand the house, including removing the original third floor, with its mansard roof, and adding three additional floors, two of brick and the third “in roof.” They also received permission to construct an addition at the rear, 38 feet by 18 feet 9 inches, five stories high above the basement, four of brick and one “in roof.” The Club retained the architectural firm of Richardson, Barott, and Richardson, and the work was overseen by Frederic L. W. Richardson, son of the noted architect Henry Hobson Richardson. The addition was completed in February of 1911. In May of 1926, the Club acquired 150 Commonwealth, which had remained in the Baker estate until the previous year, when it was acquired on the Club’s behalf by its founding president, Pauline (Revere) Thayer, the widow of Nathaniel Thayer. The Club remodeled the house and combined it with 152 Commonwealth. Plans for the remodeling — including elevations and floor plans — are included in the City of Boston Blueprints Collection in the Boston Public Library’s Arts Department (reference BIN P-24). In 1962, the Club enclosed the roof garden “conservatory” on the fifth floor of 152 Commonwealth, replacing the French windows with brick panels and double-hung windows. 150-152 Commonwealth remained the Chilton Club in 2017, with the 287 Dartmouth entrance as its principal address.